I’ve been logging some miles on the Pofahl built 36 inch wheeled bike and will now offer some first impressions to you on what it is like to ride this bicycle with the Conestoga sized wagon wheels. Wheels. That’s the first impression you get visually when looking at the 36″er. They are very large, and perhaps a bit goofy looking. However, what you don’t notice is how big the tires actually are on this thing. Their size is masked by the sheer enormity of the diameter of the rims. However; 29″er riders would drool over the measurements of this hunk of two ply. Check out the width, which is a generous 57.3mm. The height of the casing is even more impressive at 52.2mm, which is at least two millimeters taller than a WTB Prowler. Talk about volume! This hand cut tread 36 inch tire has it in spades. Yes, I said hand cut tread. The tires are made for unicycle use on roads. So the two ply casing is smooth treaded for the most part. Their are grooves running parallel to the tire casing, but these are useless for gripping anything but tarmac. The designer of this rig, Ben Witt, wanted something that would be all terrain approved, so he bought a tire groover and spent about a half an hour per tire cutting in a front and rear specific design. So these tires are really big too, and heavy. The whole wheel is pretty heavy, so it acts like a huge flywheel. Getting the 36″er up to a speed takes some effort, but gearing helps overcome much of the initial inertia on flatter terrain. Once rolling, you can take a brief break from pedaling, return to spinning the cranks, and find that you haven’t lost any speed. Even rolling up inclines becomes effortless if you speed down the preceding down hill. That said, nothing happens very quickly on a 36″er. It forces you to be calm and deliberate in your pedaling, your maneuvering, and in your whole attitude while riding. A calming experience? Perhaps, I don’t know that I would go that far with it, but it is fun. Very fun, and it makes you work at a much lower level, but constantly. In fact, for early season training, “long, slow distance” becomes a reality with the 36″er. There really isn’t another choice. Not to say the bike is slow. It’s fast as any other bike on the tracks I have tried it on. In fact, I cut off some time on my work commute with it. It just feels ponderous, and your body works at a slower pace while riding it. Strange sensations, but pleasant ones, and quite different than smaller wheeled bicycles. At least in my humble opinion. Now for some distance riding and maybe some mild single track, but only after the spring floods have cleared. Stay tuned! The first time I became aware of a 36 inch wheeled bicycle was back around 2002 when I saw a picture of a Coker cruiser. That was pretty much a novelty bike. I didn’t really think anything more about that. However, in 2006 when Ben Witt of Milltown Cycles told me he was designing one, I was floored. He was adamant that he thought the concept would be more than just a curiousity, and his enthusiasm for the project got me really excited about it too. Then, in 2007 at the annual dealer open house at Quality Bicycle Products I saw it, and rode it. It was as I said at the time, “the most grin inducing bike I have ever ridden.” That still holds true today, and now that very bike, painted red, is at The Lab here for a short time. So hang on as I take this big wheeled rig on some rides and report on my findings here. I’ll give my impressions of this bike and my thoughts on its applications. One thing is for sure: It’ll make you smile everytime you ride it. For more on the tech behind the 36″er, watch for my report on The Cyclist coming soon. The 650b wheel is a niche market, as niche as they come right now. Well the 36er might be a bit more hidden and harder to come by as of today but most folks don’t know what 650b is, or was, or will be. The largest issue I see holding back the 650b, or any large technology advancements, is that the cycling industry is trying to streamline every part of the bicycle. As a shop employee I can recognize the need for standardization. In a shop it helps with stock, knowledge and over head. In the industry at large it helps with tooling cost and allowing all the parts to work together. Being too standard can be a problem too as it can keep from the industry growing. What would of happened if years ago when Aheadset was figuring out thread less technology they thought to themselves “Gee, this is going against every threaded headset standard and we might have to redesign forks too! That is sure a lot of work, let’s give up.” If they had said that or thought anything along those terms we all, maybe, would be riding thread less headsets. Everyone is scared of the 650b. If this is to catch on, who is to say that a 28″ wheel won’t be released at the next Interbike? No one. So now the industry is huddled up, waiting for the next big name to jump on board before THEY take the head first plunge. The ball (or trend) has started to roll and as the ball is getting larger it also means larger companies are starting to jump on. One other thing I am noticing, almost daily, is that the consumer base is catching on and this trend is not stopping. Every one of my last 6 rides, on one of my 650b steeds, someone has taken notice. They stop me in the parking lot or at the end of a race to ask me about it. Sure, these are avid cyclist that search the internet and MTBR daily but they know what it is! They have been interested enough to read up, visit this blog and others, to be educated. Lately there has been some excitement regarding 36″ers, the huge wheeled bikes that were first just a novelty. In fact, the first 36″ers widely known were Coker cruiser type bikes. Now there is a “new breed” tramping the trails and back roads with a hint of more to come. 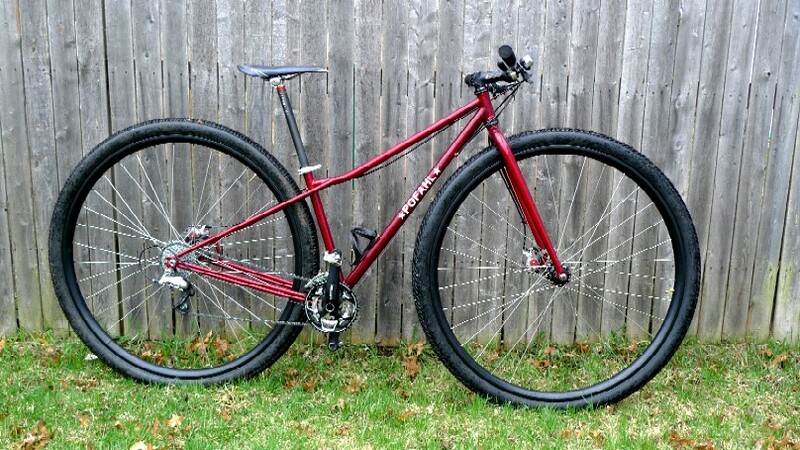 Arguably the first off roadable 36″er came from the mind of Ben Witt of Faribault Minnesota. (There are rumors of a Kansas 36″er, but only hearsay, no real evidence has come forth) The bike made it to The Big Wheeled Ballyhoo where Ben put it to the test on some single track. From that effort, Ben went back to the drawing board and produced a better, more refined 36″er, which resides at his shop to this day. Inspired by Ben’s 36″er creations, Blonde Fabrications was the next to produce this stunning 36″er. It wasn’t just for show either. The bike was ridden in the Fat Tire 40 event during the Chequamegon Fat Tire festival in 2007. This raised a few eyebrows in the racing community. Enough interest was raised that this effort was produced for an attempt at the 24 Hours at the Old Pueblo in 2008. Sporting 180mm OD hubs and dual front disc brakes, this version of a 36″er attempts to address the issues involved in making a truly strong off road 36″er wheel. Are there more 36″ers coming? The obvious answer is yes. As far as a “trend” or any mainstream acceptance is concerned, it is doubtfull that 36″ers will ever become something you will find at your local bicycle shop, or will it? Time will tell. No matter where 36 inch wheeled bicycles go from here, one thing is certain. They are the most smile inducing bicycles this author has ever ridden, bar none. Editors Note: From time to time we get a question that we choose to post here. The answers given hopefully will help others and at the least, be somewhat entertaining. Question: Can I put a 26 inch rear wheel in my 29″er? How will that affect the bike? Is it a good thing to try? Answer: Well, three answers really. Yes. Negatively. Not really. Now, let me flesh this out for you. The answer to your first question is “yes” only if you are dealing with a frame and wheel that is disc brake compatible. Rim brakes won’t work with such a change in diameter. Pretty simple there. The second answer, “negatively”, is a bit more complicated. Let’s take a look at what really is going on when we pop a 26″er wheel in a 29″er frame. Think of the front axle as a pivoting point. Now imagine lowering the rear end of your bike without a rear wheel in it by pivoting the bike downwards around that front axle. Watch how the angles all become slacker and the bottom bracket gets a little closer to the ground. Yep! That’s what is going to happen to your 29 inch wheeled bike when you put a smaller rear wheel back there. This causes several things, all of which I would deem negative, and I think most of the time, in most cases it is true. First the head angle gets shallower, causing slower steering and strange cornering behaviour. The seat angle changes, putting you further behind the bottom bracket and adversely affecting your seated pedaling posistion. It also will make seated to standing pedaling posistion maneuvers more difficult to pull off. Finally, your bottom bracket will be closer to the ground, increasing the chances for pedal strikes. Now for the third answer, “not really”. It isn’t going to be a good representation of what a properly designed mixed wheel bike will do. At best, you will have a functional bicycle, at worst, it may be deemed unridable off road. Best to save up for a properly designed mixed wheel bike and leave the 29″er alone. About a year ago we reported on the 36 inch wheeled bike belonging to Ben Witt of Milltown Cycles. We got to ride it there and we also got another look at it in June at the Big Wheeled Ballyhoo. Since it has been awhile since we had heard anything on the “big” big wheels, we called Ben up and chatted with him. He told us about some recent developements in the wheels that might make future 36″ers a bit more practical. Of course the really astounding and problematic thing with any 36″er design is the wheels. Ben was quick to point out to us last year that he was concerned about the stresses that a disc brake would put on the spokes and in particular, the spoke bed of the rim. Ben was concerned that a spoke might be pulled through the simple rim design he had to use, ( seeing as how it was about his only choice) and that the lack of eyelets to reinforce the area around the spoke drilling was to blame. Well, now it appears that another, more refined rim choice is available along with a better tire. 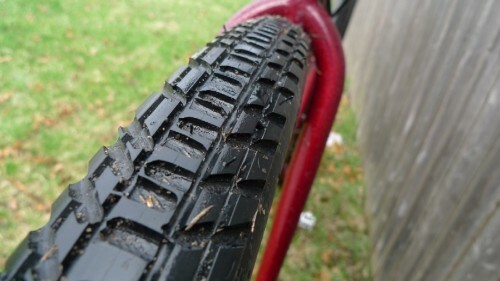 Enter the Nimbus Nightrider tire and Stealth rim combo that will soon be available from Unicycle.com. 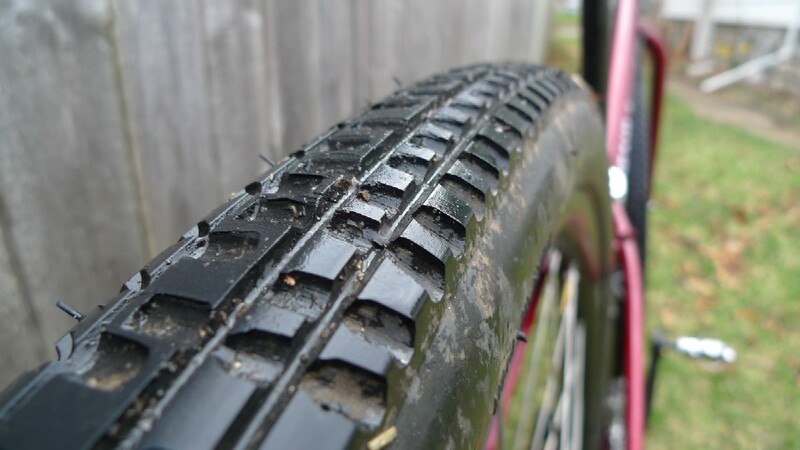 The Nightrider tire and Stealth rim have made many improvements over the original wheel and tire used on the 36″er we saw at Frostbike last year. The rim has reinforcing eyelets around the spoke holes and has a parallel machined brake track. Ben says he has not seen the rim yet, but the features indicate to him that the rim is of a better manufacture than he used before. It is also reportedly lighter as well. The Nightrider tire is of a 2 ply design, which Ben says will lead to a more supple casing, lower rolling resistance, and will be lighter. The cross hatched tread pattern will also make customizing the tread easier for Ben and will result in further weight loss. It looks as though we will be seeing more developements in 36 inch wheeled bikes besides these tires and rims. Ben and others interested in this wheel size are playing with some ideas and pushing the boundaries of what is possible. Ideas that will be revolutionary and at the least, very interesting to check out. Twenty Nine Inches will continue to keep tabs on the future developements in 36 inch wheels and bring them to you as they appear. You might remember our Interbike Coverage from last fall when we showed you the first prototype of a new soft tail design by Siren Bicycles called “Song”. The first prototypes have been ridden and analysed and now Brendan Collier, head honch of Siren Bicycles, has developed some parts that have refined and improved upon the originals. As you can see, the flex plate assembly mock up shown here has been refined and changed a lot from the original design. Brendan moved the flex plate brace to the underside, minimized the chainstay connection, and basically gave the whole assembly a cleaner more organic look over the original. Brendan has told me that developement is moving right along and that the next generation of Song bikes with the new flex plate should be debuting this spring. Actual Song bicycles for sale should follow shortly there after. The Song itself will be available in a “55” format, (Brendan’s moniker for a 69er design) or as a full on 29″er. Design features promise at least 1.5″ of rear travel using a Cane Creek damper unit. Tire clearance has been improved with the new flex plate, but until actual bikes hit the trails I can not report on how big a tire will fit yet. The bolted assembly may allow for switching out of rear triangles or to allow for breaking down the bike for travel purposes. Two possible features that Brendan is looking at yet but may not make it to production. Thanks go out to Brendan Collier and Siren Bicycles for sharing this update with Twenty Nine Inches. We will be bringing you more on the Song or any other Siren 29″ers as the news becomes available. CED is a very small custom builder in Ashland, VA. Can’t see the hubs, but he machined them as well for this build. One of the highlights for me from the recently held Interbike trade show was catching up with Brendan Collier of Siren Bikes. Here’s Brendan and his latest creation, the Siren “Song”. It’s Brendan’s take on a soft tail design with a twist. It’s a “69er” and he’s not relying on the aluminum stays for flex, as some other famous soft tail designs do. Here’s what is flexing to get the estimated 2″ of travel from this design. It’s a titanium plate attached at both ends to the aluminum frame at the rear of the bottom bracket and the yoke between the chain stays. Brendan stressed that this is still in development and that he has plans to more cleanly integrate the plate into the frame structure. Here’s another view of the plate and it’s design. Brendan expressed to me that he has several options to explore before he settles on a final design for the plate. In the meantime, this frame shown at Interbike is already being ridden by endurance athlete extraordinaire, Dave Harris. Dave will be using this for his assault on the 24 hours of Moab soon, so make sure to check out the results after the event to see how things went. You can also keep up with how the Siren Song prototype is doing at Dave Harris’ blog. Brendan was pretty excited about this new project and described to me how the suspension should work. It has a proprietary shock by Cane Creek, specifically tuned to work with this design. Based on the AD series, the shock is set so it has a “preload” condition allowing the shock to be more active over smaller trail chatter. The shock is also very tunable, and should work for a variety of trail conditions and rider preferences. Cane Creek also offers different valving options that can further alter the way the rear end works for a rider. Finally, I had to ask if Brendan planned on offering a full on 29″er version of this design in the future. The answer was a resounding yes. Brendan wants to first get the 69″er version in the can and then he’ll focus in on the 29″er version of the Siren Song sometime in early ’08. I can’t wait to see how this bike works for Dave Harris and to see the 29″er version in the future. I think Brendan is on to something here, since soft tails and 29″ers seem like a great idea to me. Check out the future progress and Siren’s other bikes at their website. A Scalpel 29″er? I have an anonymous source telling me that Cannondale is currently testing a 29 inch wheeled version of it’s Scalpel full suspension bike. The source said that plans are to bring this proven design and technology to the 29″er realm but not until the ’09 season. Well, that’s a long wait but it leaves plenty of time to save your ducats! Trek World This Weekend The Trek/Fisher/LeMond/Bontrager dealer only show is this weekend up in Madison, Wisconsin. Look for a full pictoral report along with any other tidbits that I can dredge up myself. We will be posting things like images of the Cobia, X-Cal, and Rig 29″ers for ’08 along with Trek’s “69er” line up. Stay tuned for that and more next week! You are currently browsing the archives for the Rogue Wheels category.